Imagine not being able to understand the doctor in a medical crisis. This is reality for many deaf people. Dayle McIntosh Center (DMC) offers a 24-hour sign language interpreter service for medical facilities and deaf patients or family members to access so that accurate diagnosis is obtained, treatment is understood, and informed consent is ensured. The program also makes it possible for participating hospitals to comply with legal requirements set forth in disability legislation. Due to the structure of the COMMEND program, deaf individuals are not required to become consumers at DMC to receive assistance. Any deaf individual in the program service area is eligible to use COMMEND. Typically, the service is requested through the medical facility and not an individual. Since medical personnel initiate COMMEND services, individual referrals are not necessary. Hospitals and other medical facilities contract with the Dayle McIntosh Center for the provision of sign language interpreter services, which are provided on an emergency and non-emergency basis. The terms under which services are provided are detailed in the contract, as well as, the rates charged. When a deaf individual is scheduled for in-patient or out-patient treatment at a contracting medical facility and interpreter services are needed, a request is submitted to the DMC interpreter services specialist. In such cases, the procedures for non-emergency interpreter services are followed. 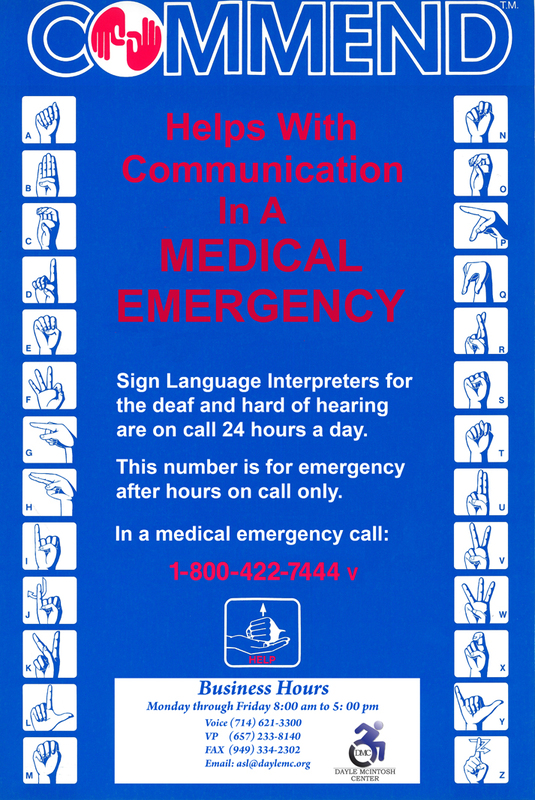 Deaf individuals, who come to a contracting hospital in a medical emergency, are assisted through the COMMEND program. If the crisis occurs in normal working hours, medical personnel contact the DMC interpreter services specialist to request that an interpreter be dispatched. If the medical emergency occurs after working hours or on the weekend, the hospital calls an (800) phone line that is maintained for this purpose. The (800) line is monitored by operators, who are trained to receive emergency requests and dispatch interpreters. Additionally, the DMC interpreter services coordinator is available as back-up support should the answering service encounter difficulty filling the request. Qualified interpreters, who are part of the Dayle McIntosh Center registry, are paid a stipend to be on-call for emergency assignments. 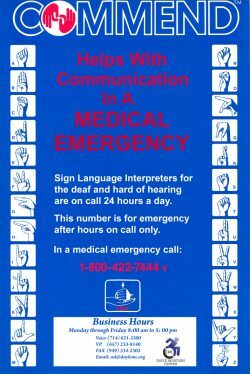 When an emergency assignment has been accepted by an interpreter, he or she is responsible to provide assistance according to industry standards and the code of ethics established by the Registry of Interpreters for the Deaf. A voucher signed by the contractor is submitted to DMC to verify that interpreter services have been provided. Interpreters, who apply to respond to COMMEND calls, are evaluated by a panel of highly qualified reviewers. The interpreter’s ability to translate complex medical terms and interpret sign to voice and voice to sign is assessed. Applicants, who pass the evaluation are designated as COMMEND interpreters. Interpreters are not DMC employees, but rather independent contractors. Two requests for emergency interpreter assistance were received by the Dayle McIntosh Center at the same time. Both patients were in labor and delivery and both mothers-to-be were deaf. DMC was able to dispatch qualified interpreters for each birth. One patient had a boy and the other had a girl. A deaf man went to the emergency room with severe abdominal pain. He was frightened and highly agitated, because he couldn’t understand the doctor’s questions. Emergency room personnel called COMMEND and an interpreter was sent to the hospital. After communicating with the patient, the doctor diagnosed appendicitis and recommended emergency surgery. The COMMEND interpreter explained the situation to the deaf patient and helped him to prepare. The surgery was successful and the man was grateful that the pain was gone. Both the ER personnel and the patient commented on how much easier treatment went with proper communication. Children’s Hospital of Orange County requested sign language interpreting services through DMC for a deaf little girl, who was hospitalized for 40 days. The Dayle McIntosh Center was able to provide interpreter coverage from 6:00 am to 11:00 pm almost every day throughout the child’s stay at the hospital. The mother of the patient was extremely happy with the communication services arranged by DMC and called to express her gratitude for the assistance provided by the interpreters for her little girl.